JohnHancock is a Legacy Library. Legacy libraries are the personal libraries of famous readers, entered by LibraryThing members from the Legacy Libraries group. » John Hancock's legacy profile. JohnHancock is also an author. About meJohn Hancock (23 January 1737 - 8 October 1793), Massachusetts merchant and statesman. Born in Braintree, MA, Hancock was raised by his wealthy uncle Thomas in Boston. He graduated Harvard in 1754 and took a role in his uncle's mercantile business. 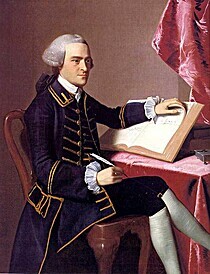 In 1765 Hancock was elected a Boston selectman, and became a leader in the colonial opposition to British trade and tax policies in the late 1760s. He was made the first president of the Massachusetts Provincial Council, and in December 1774 named as a delegate to the Second Continental Congress, of which he was elected the presiding officer in May 1775. He served in Congress, with several short exceptions, through July 1778. His signature on the Declaration of Independence may be the most famous autograph in history. Under the 1780 Massachusetts constitution Hancock was elected the first governor for several consecutive terms until January 1785, and again from 1787 to the end of his life. Although very ill, he played a key role at the Massachusetts convention to ratify the Constitution in January 1788. Hancock married Dorothy Quincy in 1775; they had two children, but neither survived to adulthood. About my libraryHancock's library is mostly preserved in the inventory of his estate. Other titles have been added from current institutional holdings.